Propaganda is a viral documentary film that blurs the line between reality, fiction and persuasion. Suggesting what might be a fictionalized premise that the film was presented to a translator from possible defectors from North Korea, the film is apparently a work of propaganda aimed against western society and culture as a means of bolstering the strength of the DPRK. 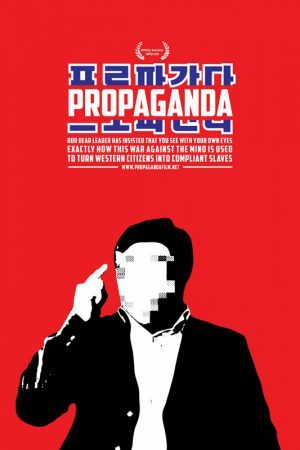 In truth, the supposed framing of the film as the work of North Korean propagandist is likely untrue, and only part of a larger attempt to satirize and deconstruct the propaganda models working within Western society. Though blending elements of humour in the tradition of the mockumentary, the film more accurately finds kinship with figures like Noam Chomsky in using the propaganda model itself as a means of deconstruction perceptions about “manufacturing consent” through the use of media that pacify, distract and glorify. Using almost exclusively archival footage from television and pop culture, Propaganda condemns western culture using it’s own creations. This is not unlike the means that Imperialism took notes from practises, customs and behaviors of different cultures as a means of dismissing them as savage or uncivilized. The big question of the film becoming, whether we are absorbing things without their proper context or if there is a legitimate reason to fear or be wary of those in control. Cleverly sticking quite closely to the truth and employing rhetoric in popular media, the film suggests how easily propaganda is created and suggests a double-edged conclusion that the way we perceive ourselves is as twisted as the media’s portrayal of the “other”. The apparent guise of being the product of a North Korean propaganda team only serves to force self-reflection. The pointedness of this disparity is perhaps to test how resistant audiences are to the truths about their own world and environment, as to whether or not they will outright dismiss the content of the film as being the work of a foreign enemy or absorb the whole thing as truth.